Cunard’s Queen Elizabeth cruise ship partnered with April5 to create a functional and transportable tribute to ‘100 years of ANZAC’. A tribute wall filled with poppies provided the opportunity for the public to mark the occasion at ports and on-board during a six-week journey. Cunard is one of seven iconic Carnival Australia brands, which together accounted for more than 70% of the one million-plus Australians who took a cruise holiday in 2014. With passenger numbers growing by an average 20% annually for the past 12 years, Australia is the fastest expanding cruise market in the world. 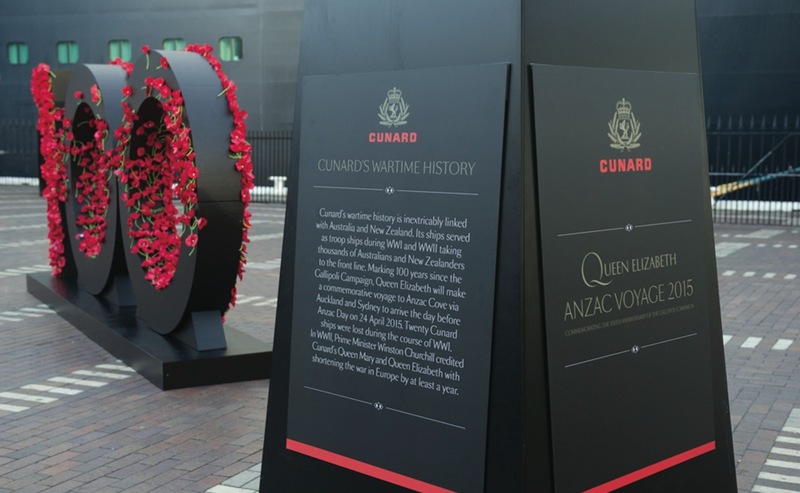 Cunard approached April5 early this year with a campaign to bring together Queen Elizabeth and a celebration of ANZAC. The 2015 centenary of the ANZAC tradition provided the opportunity to engage the public in a respectful, relevant yet humbling activation, which would mark Cunard’s long-standing association with Australian and New Zealand wartime campaigns, including Gallipoli. Cunard’s Queen Elizabeth cruise ship’s tribute to ‘100 Years of ANZAC’ activation provided the opportunity for the public to mark the occasion at ports and on-board during a six-week journey. The voyage would begin in Auckland and Sydney, and end with a poignant on-board service off the Gallipoli peninsula. Cunard’s proud 175-year maritime legacy is interwoven with Australia and New Zealand’s military history. Since the Crimean War (1853 to 1856), Cunard ships have assisted Allied forces in times of warfare, including during World War I when 20 Cunard ships were lost. Two Cunard ships – RMS Mauretania and RMS Aquitania – moved troops to the Mediterranean at the time of the Gallipoli expedition, with Aquitania then converted to a hospital ship, carrying 25,000 injured Allied troops back to the UK until early 1916. The activation had to be functional and transportable, enabling interactions with the public at both Auckland and Sydney ports, on-board during a journey halfway around the world and, finally, at the commemorative service off Anzac Cove in Turkey. As this was such a significant historical event, April5 had to ensure relevance and respect was reinforced and adhered to for the entire journey. It was essential to ensure all elements were managed with sensitivity and respect for all ANZACs and the leading political, military and community figures attending special morning memorial services led by Australian War Memorial director, Dr Brendan Nelson. To create an activation that captured Australians’ and New Zealanders’ attention and got them reflecting on the importance of the centenary of ANZAC required an appeal to their emotive sides in a simple, yet impactful way. 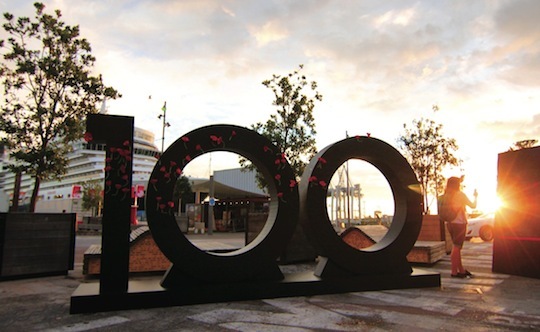 April5 together with Cunard came up with the idea to create a ‘100 Years of ANZAC’ feature incorporating the poppies that are synonymous with ANZAC Day, and a permanent record of a Remembrance Book. The centrepiece of the feature would be a two-metre high ‘100’ structure, directly linking the activation to the upcoming centenary. It would provide an opportunity for the public to pay their respects in a tribute that would see their messages – recorded in the Remembrance Book – travel across the seas to the site where our ANZACs fell 100 years ago. The tribute wall would be filled with 11,500 poppies donated by Australians and New Zealanders during Queen Elizabeth’s calls to Auckland and Sydney as part of the cruise – with the number of flowers designed to represent the number of ANZACs killed during the campaign. Adding a human element, two families of original ANZACS – one from Australia, one from New Zealand – were invited to join the voyage as custodians of the 11,500 poppies as they embarked on an emotional journey, retracing the footsteps of their ancestors. As media partners, Cunard specifically chose MediaWorks NZ’s then 7pm current affairs show Campbell Live, and Network 7 in Sydney. Both networks were interested in following the human story of the families travelling. April5 had to devise a way to build the large 100 structure that had to be transportable, weather proof, light and impactful – with the ability to easily insert thousands of poppies and ensure they remained in place for the duration of the voyage. Cunard’s Queen Elizabeth embarked on its seven-week memorial journey to Gallipoli, starting in Auckland, New Zealand followed by Sydney and then onto the waters off the Gallipoli peninsula. April5 managed the bump in and out of the ‘100 Years of ANZAC’ feature, which was set up at Queens Wharf, Auckland and at Circular Quay, Sydney utilising the dramatic backdrop of the Queen Elizabeth ship. 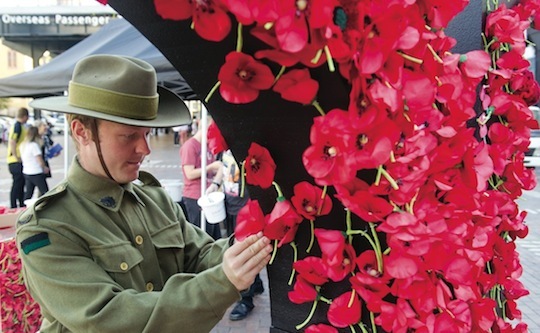 In Auckland and Sydney, patrons near each Queen Elizabeth activation site were invited to pay tribute to their ANZAC heroes by placing a poppy on the ‘100 Years of ANZAC’ feature, with the centrepiece the two-metre high polystyrene ‘100’ structure to be filled with the poppies. Made of polystyrene for both its light weight and ease of pinning in the poppies, the structure was painted black to gain both full colour impact when the red poppies were attached – and as a mark of respect reflecting the sombre occasion. A large Perspex box was added for further effect. Visitors were invited to write personal messages in a Remembrance Book. Supported by the RSA and Legacy, a suggested gold coin donation for each person paying their respects with a poppy was encouraged. All donations went to assisting returned service men and women in keeping the tradition of ANZAC alive. Large plinths communicated the ‘Journey of the Poppy’ and gave relevance and context around the symbolism of the poppy, as well as the part Cunard played in the tribute. Representatives of the two selected ancestral families, Herb and Marguerite Christophers of New Zealand, and Mark and Germaine Keys of Australia, made the journey representing both countries in the spirit of ANZAC. It was the first time Herb and Mark had travelled to Gallipoli to visit the graves of family members who fought and died in the battle. Herb’s grandfather was one of four brothers who died in WWI, while Mark’s great-grandfather also lost his life in the campaign. Their emotional and powerful story around the journey generated awareness via mainstream media in New Zealand and Australia. The ‘100 Years of ANZAC’ feature and Remembrance Book formed the centrepiece of the Queen Elizabeth commemorative service on the eve of ANZAC Day when the Queen Elizabeth reached waters off the Gallipoli peninsula. A selection of messages from the book were read at the service. In addition to the television partnerships, Cunard’s in-house PR, together with MG Media, distributed press releases to all mainstream media informing them of the story of the two families and the journey of the ‘100 Years of ANZAC’ feature. A special time-lapse video of the ‘100’ journey from New Zealand to Sydney and finally Gallipoli was created to share across Cunard’s social media and was picked up by several news outlets. The overwhelming support from the public and media far exceeded expectations. Campbell Live ran a back-story on Herb Christophers’ remarkable family story. The program attended the Auckland memorial service, met the couple off the ship in Istanbul, and travelled with them to visit Christophers’ grandfather’s grave. The initial story caught the attention of media in NZ and, after a press release was sent out inviting them along, the Auckland event was attended by every mainstream media outlet in Auckland. The Seven Network in Australia sent journalist Laurel Irving on the last leg of the seven-week cruise, where she reported on the journey of both couples as they got closer to Gallipoli. A time-lapse video following the poppy wall journey was created to share on Cunard’s social media to generate. In addition to the human element, branded content about Cunard’s role in wartime history delivered further media pick-up. donations of $14,000 for RSA and Legacy. The Remembrance Book remains on permanent display in the library on-board the Queen Elizabeth in an enduring tribute to the memory of the ANZAC heroes.